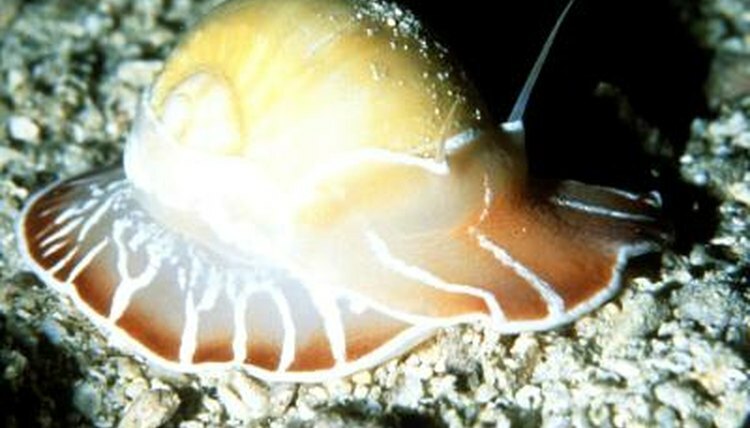 They might not be fast or particularly flashy, but snails have interests that go beyond eating algae, cleaning up the bottom of your tank and, in the case of land snails, cruising the surface. Many have a love affair with cucumbers. The veggies are healthy snacks that require just a little preparation. The cleanup is minimal, so long as you don't let the cuke rot. As with any kind of food or treat, the amount of cucumber you'll want to drop in for your snails depends on the number and type of snails and what other kind of veggie-eating fish you have, such as shrimp and ottos. One apple snail with two nerite snails, for example, will do just fine with one piece of cucumber. Add in a few shrimp and a couple more nerite snails and you're better off with two slices. If you're caring for a land snail or two, one slice will do. Aim for fairly thin slices, even if you need to drop in a few. Dropping in one thick slice will have all of your snails and other fish piling on top of it at once, and larger snails can take up most of the space. If you have a seeded cucumber, cut out the seeds from each slice. A lot of snails forgo the seeds, and the little things have a penchant for clogging filters. If you drop in a slice of fresh cucumber into a tank of water, you'll notice it floats. Blanching or sticking a fork in it helps it sink to the bottom so your snails can fully enjoy their meal. To blanch it, boil a small amount of water, toss in the cucumber slice and remove it with tongs after about a minute. Run it under cold water until it's cool to the touch. Instead of blanching, you can also stick a fork through the cucumber to weigh it down. If you go the latter route, wash the cucumber well by running it under cold water and lightly massaging the skin with your fingers. Do not use soap. If you have land snails, neither boiling nor sticking a fork in the cuke is necessary -- just make sure to wash it well. If you have a land snail, simply lay the cucumber slice in your snail's feeding dish. Dropping a cuke into an aquarium is a bit more involved. If you have larger aquatic snails, you've probably already encountered their penchant for uprooting plants. Accidentally drop a cucumber on a plant, and they'll plow through anything and everything to get to it, probably causing your plants to float to the surface in the process. Dip your hand slightly into the water, above the substrate or a feeding dish, and let the cucumber go. Make sure slower-reacting aquarium inhabitants aren't in the way if you're also dropping a fork. With some luck, your snails will devour the slice of cucumber, but results vary. If within 48 hours the veggie remains, remove it. If you notice it start turning black, remove it. If you leave it in there, it will begin rotting and, in the case of aquariums, foul up your water, requiring a water change. The cucumber might not be in the same location as when you dropped it in the tank. Snails have a thing for working their way into the middle of the cucumber so they wear it like a piece of clothing while eating, relocating it in the process.